Why did Santa deliver the gifts 2 weeks early this year? Imagine my surprise as we were having dinner last night around 6:40 pm (fettuccine alfredo was on the menu) when I heard a huge “bang” coming from the chimney. The twins, my wife and I quickly got up and went to the living room to discover a dusty Santa Claus putting gifts under the Christmas tree. “What the heck?”, I said out loud. “Santa, it’s 6:40 pm on December 12th! What are you doing?”, I asked. “Ho, Ho Ho!” said the old man. “What do you mean? I’m delivering your Christmas gifts. Can’t you see?” said Santa. “I can clearly see that you are bringing gifts but my question is why on the evening of December 12th? You are 2 weeks early!” I said looking at the various gifts on the floor. All of a sudden I noticed one gift wasn’t even wrapped. Santa noticed I saw the un-wrapped gift and said “Sorry about this one, there are a few little issues but it should do the job for now anyway – especially considering I am 1 year late!”, he added “… and I apologize since these gifts are for 2009. I’ve really busted my timelines this year”. Whipping his forehead, Santa said, “I don’t have much time to explain but I prepared this document for you to explain everything. I am sure you will find it very useful. My elves spent the last 9 weeks writing the document”. “They elves wrote a document instead of working on preparing the gifts? Really!”, I said. Before I could say anything else Santa turned around, moved up the chimney and disappeared. My wife and kids looked at me stuned. “Daddy, what’s wrong with Santa?” asked Alessia. “Sweety, daddy doesn’t quit know but I’m sure I will find the answer in the huge manual Santa left us”, I said pointing toward the document. “Daddy, look! This box is wrapped with toilet paper and it looks like it was open. What’s in there?” asked Giordano. Before I could even speak, he had ripped the paper and opened the gift. “Daddy, these are the pokemon cards I asked for last year. I’m too old to play with these. I don’t need them anymore” said my son angrily. “Dear Mister. With the greatest magnitude of our sorrows and an unexplainable reason ask for your forgiveness in the event of the delay for the gifts of Christmas and to your honorable family…” I read from the document. “Honey, this looks like it was translated into bad English. “Do you think Santa outsourced the elves’ work this year?” asked my wife. Flipping true the book, “It looks like Santa claims that as part of the implicit agreement and based on our list of last year wish list, he delivered what we asked for”, I explained. “As I can see from the documentation, Santa no longer accepts changes in people’s request which is way he delivered what we asked for – even if it is no longer required”, I told my wife. “Mommy, looks like Santa dropped an envelop on the floor before leaving”, said my daughter as she gave the envelop to my wife. “Well, I can’t believe it. Santa is asking for a bigger budget and claims he will deliver the remaining gifts around March 14th!”, said my wife clearly upset. “Wait a minute” I shouted. “It seems to me that Santa should be using Scrum next year. I’ll give him a call on Monday to explain how it could help him deliver on the expectations…”, I concluded before we all went back to a cold dinner. For those who have been reading this blog for a while, it will come as no surprise that I’m very interested in helping organizations transition to Agile. My contribution is to focus mainly on the managers and leaders, and how they need to modify their leadership style to take advantage of the benefits agility brings to their organization. Since writing I don’t feel so good – I’m a people manager in an Agile organization, I’ve been on the look-out for good posts on the role of the manager in an agile organization. Below are my 10 favorite articles for 2010. Drop me a line if you feel I’ve missed something. It dawned on me recently that organizations are lead and managed by accountants. Accountants come in many shapes and forms and not every accountant wears brown socks. I suspect you will disagree with my statement arguing that your CEO isn’t a former accountant or that your CTO didn’t even take a single accounting class in his life and I would agree with you. Not all accountants carry a pocket size calculator. I personally don’t have many complaints about accounting itself, after all there is value in knowing how much money enters your coffers and how much you had to spend to generate the associated revenue. That makes perfect sense to me. Where I have a problem is when common sense leaves the building to make place for accountant-based logic and the need to book everything against the right account and the use of money within certain time intervals. Let’s take project management [Ah, now you are starting to see a link between accountants and Agile projects]. In many of the organizations I had the pleasure to work with, compliance to project plans was more important than delivering real value to customers. Nobody asked if it made sense to add new features or change the sequence of activities in an attempt to deliver business value to customers faster. People are concerned with compliance to the plan. And where does this need for compliance come from you ask? Accountants. Before the debit-credit masters come running after me with their red pen, I will confess I used to be one of them (sorry!). I understand the mindset, their perspective of the world and most of all, the need to put things in neatly defined categories – some can be amortized while others can’t – but I digress. The project timelines are derived from the accounting cycles – the money is allocated for a certain budgeting period instead of true market needs. The phasing and allocation of the resources is driven by the departmental allocated budgets. The profile of the resources assigned to a project is driven by who has the money as opposed to who has the skill set. Does any of this make sense in a context of business excellence? That’s one of the reasons why I like Scrum with its focus on delivering the highest business value sooner. Scrum isn’t perfect, I know but it forces people to make decision based on business value, not accounting rules. Scrum is also great a giving visibility the what is really going on within a project as opposed to estimated project completion for cost computation. In heuristic tasks such as software development is it really critical to know that task ABC costed $357? Chances are, you are unlikely to do anything useful with that information. Why wouldn’t you rather determine the cost of an iteration (or a sprint) so you can compare it to the business value delivered. As I stated earlier, there is value in accounting but when everybody starts to behave like an accountant, it is a sure sign that common sense is gone and that the organization is ripe for an Agile makeover. 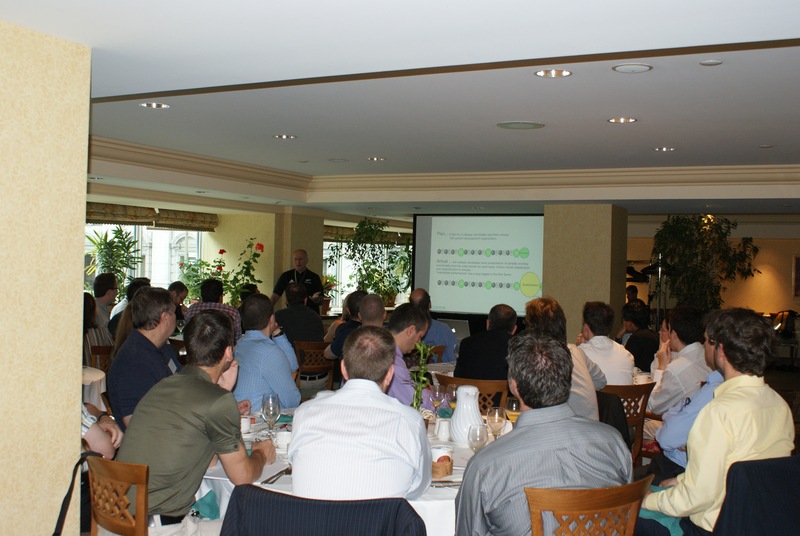 Last week, I attended the breakfast conference presented in Montreal by Ken Schwaber. As always, Ken gave a great presentation focusing on the “definition of done” in Scrum and the impact of incorrectly defining what done really means. Nobody likes to drive on a street with potholes. So what do cities do? Obviously, they fix them! If you live in Montreal, you realize that every year, the city fills thousands of potholes in an attempt to keep their streets in a good driving conditions but no matter how much efforts (and money) the city invests, the potholes keep appearing. Isn’t this like implementing Scrum within an organization? As attendees to Ken’s presentation, weren’t we simply like city workers attending an asphalt conference? It is as if an asphalt guru was explaining to us the right mix of tar and rocks to make the most resistant asphalt when in reality, the problem isn’t really with the asphalt itself but with the city’s traffic management approach. The definition of done is critical. The right people in the right roles is important. Dedicated teams members is crucial. But what about the managers in the organization? Are they supporting Scrum? I mean, are they really supporting the use of Scrum within their organization? Don’t get me wrong. I truly believe doing Scrum the right way is critical but it is not sufficient to be successful. If your managers aren’t on board, you can try to implement as many of the Scrum best practices as you want – including the right definition of “done” – your teams will never reach the highest level of performance they could. Get the managers on board and your Scrum implementation will be greatly improved. For those of us who have been working with Agile for a while, the values, the principles, the approach, the methods and the practices are almost second nature but for those who start to enter the Agile world, the ramp up can be challenging – especially if you are looking at all of this from a management position. After being asked by a few people “Where can I start if I would like to know more about Agile?”, I decided to put together this short list of reference material. There is also a good discussion happening on LinkedIn. I am missing anything? Is there material you would recommend to managers? Agile software development refers to a group of software development methodologies based on iterative development, where requirements and solutions evolve through collaboration between self-organizing cross-functional teams. The term was coined in the year 2001 when the Agile Manifesto was formulated. “Agile Development” is an umbrella term for several iterative and incremental software development methodologies. The most popular agile methodologies include Extreme Programming (XP), Scrum, Crystal, Dynamic Systems Development Method (DSDM), Lean Development, and Feature-Driven Development (FDD). Just what is agile software development? In 2001, a group of methodologists got together to agree on a common set of guiding principles around effective software development. Rather than summarize their agreements here, I’ll point you to their “agile manifesto”. Scrum is an iterative, incremental framework for project management and agile software development. Although the word is not an acronym, some companies implementing the process have been known to spell it with capital letters as SCRUM. This may be due to one of Ken Schwaber’s early papers, which capitalized SCRUM in the title. In my quest to better define what Agile Leadership is and in an attempt to help managers, leaders, and stakeholders understand which behavior to modify in order to achieve a successful Agile transition within their organization, I broke down the key dimensions associated with an Agile Project team – an upcoming post will present the Agile Leadership dimensions. Based on experience and relying on numerous books and blogs published on the topic, I have extracted seven key dimensions in an attempt to generalize the concept. My goal is to help teams and organizations going through an Agile transition understand which dimensions to modify to change the status quo. I will define at length and provide reference material in an upcoming post. Out of the roles defined in Scrum, the project team is a key area impacted by an Agile transition. Many changes are required in order to take full advantage of the transition – from a motivational and a performance perspective. In this context, the project team encompasses the members of the core project team that are working toward the same end goal, which is to deliver results. There are tens of variables that have been identified as key success factors for a successful agile transition. My objective is to group them under 7 dimensions. This does not mean that other dimensions aren’t important or that I offer an exhaustive list. My goal is simply to summarize the success factors under a handful of dimensions. The concept of self-organised team is one of the pillars of Scrum. In his recent book Drive: The Surprising Truth About What Motivates Us, Dan Pink presents the differences between empowerment and autonomy (more on his book in an upcoming post) with such compelling arguments that I felt “autonomy” is a much better description of what we aim to achieve with the implementation of Scrum. As such, the team needs to have the ability to determine the sequence of the tasks to be executed, the assignment of each task, the method used to complete their work and other rules required to allow the team to achieve performance while enjoying their work. Are people on the team able to make decisions themselves and accordingly adapt to changing situations? Does the team determine “how” to solve their issues? Can the teams select the standards and practices that better allow them to produce the right solution? Can the team divide the work as it chooses? Do training, holiday, and vacation time get cancelled when the project falls behind schedule? Can the team members determine who is on or off the team? Does the team maintain a high rate of productivity without being overworked? As with other expertise, project team members must possess and/or develop certain competences in order to take advantage of the new approach. Although some of the new skills are technical in nature, many are softer interpersonal skills. Does the product owner possess the right skills and abilities to successfully execute his role? Are the employees always in an optimal role (matching the requirements with the capabilities and interest of the individual)? Do the team members have the required knowledge and expertise to successfully deliver the expected solution? As an Agile team relies on its autonomy to complete its work, the concept of accountability becomes even more critical than it is in a traditional team structure. The lines between the responsibilities of each of the team members become more blurry as tasks and timelines get re-assigned in order to meet the expected results. Do the team members clearly understand their responsibilities? Are the team members committed to the delivery dates? Are all the delivery dates clearly communicated and known by all team members? Does the team successfully deliver functional software at the end of each iteration? Does the team know its velocity? Collaboration is a central them in Agile and it is more than two people working side-by-side. In the context of Agile, strong collaboration is a critical quality the needs to be demonstrated by the project team and throughout the duration of the project. Is the business representative an active member of the project team? Is it accepted that the detail of both the requirements and the solution will emerge as the project progresses? Does the project team accept changing business needs? Do team members accept tasks outside their role and responsibility in order to successfully deliver? Are developers included in the planning process? Are the team members heavily involved in the decision making process? Is the product owner willing to discuss trade-offs between scope and schedule? Just like collaboration, communication is an elusive concept that is fundamental to the success of the project team. Are the right tools in place to facilitate the communication process between team members? Is a wiki in place to centralize access to key project information? Does the team have a collaborative space allocated to them? The empirical nature of Scrum imposes continuous improvement to the project team. In order to implement the process for the team members to learn and develop their skills, certain aspects need to be established up front and improved throughout the project life cycle. Are the team members’ performance periodically evaluated and honestly communicated? Are the best practices challenged on a regular basis? Does the team use an empirical process to learn and improve their performance? Does the team hold retrospection sessions to improve? Does the team reserve time to implement improvements? Finally, to take advantage of the changes an Agile transition brings, the project team needs to use different tools and processes in order to avoid falling back to their old patterns. Does the product owner understand that solving 20% of the problem delivers 80% of the value? Is the team composed of a group of 5 to 9 people? Is the team capable of starting the projects with incomplete requirements? Are projects broken down into smaller components? Are the required processes clearly defined and communicated to all team members? I am currently working on a more exhaustive questionnaire to help those going through a transition monitor their progress. I hope to share the questionnaire shortly. These are only 2 examples of a quick google search that returned over 44.1 million pages. Try “I hate my job” and the content of the pages returned is also very sad. I don’t intend to go into socio-psychological analysis in this post but I wonder if something as simple as trusting your employees to do their job properly would actually increase job satisfaction? For most people, enjoying their job would simply mean doing the same type of work but in a different work setting. Many people have spent years studying to develop their expertise in a specific field that they love. Then, one day, they start working and life becomes miserable – not because they hate what they are doing but because of the way the are treated at work. Once again, I don’t want to go into harassment or this type of treatment. The only point I’m raising is that letting professionals determine the best way for them to complete their work would is such a simple of increasing job satisfaction. “Yes, but I’m the boss” – you reply. So what? The fact that you were hired to lead or manage people in achieving a team or departmental objective doesn’t make you the most qualified individual to resolve day-to-day issues. “Yes, but I’ve done this job before” – you insist. Once again, so what? The individuals performing the job now bring different skill sets and expertise to the equation and as such are qualified to address their work as they see fit. You may provide guidance or answer your employee’s questions when they come ask for help but not tell them how to do their job. Put together a community of expertise so people doing similar work can support each other. Provide tools if they need, support your employees in finding the right answers to their problems but don’t tell them how to do it. There is a small Japanese car-manufacturer that understood that concept a while ago. They are now the largest car manufacturer in the world. Don’t you wonder how they achieved their success? You can copy, distribute, and use the content of the presentation in accordance to Creative Commons Attribution 2.5 License. Scrum is an Agile management process that uses an iterative and incremental approach to deliver complex software development projects. The three fundamental roles of Scrum are : the Product Owner, the Scrum Master, and the Scrum Team. 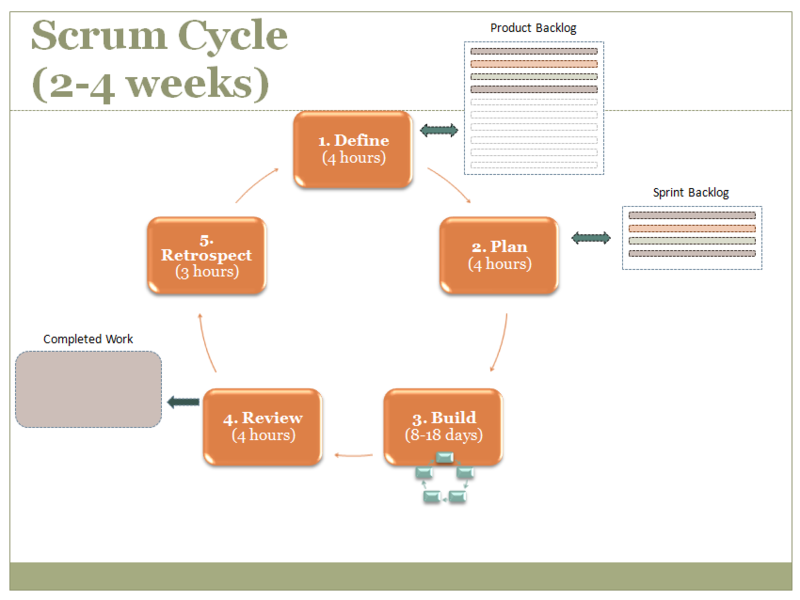 The Scrum cycle is divided into five activities to be completed by the Scrum Team in order to meet their commitment to deliver on the work included as part of the sprint backlog. During the definition phase, the project team (the Scrum Master and the Scrum Team) meets with the Product Owner to determine and agree on the priority of the team for the duration of the sprint. The intent is not to agree on the details during this stage but the high level direction the team will follow. The outcome of the definition stage is to start populating a product backlog. Planning consists of selecting the high level items from the product backlog and evaluate the value of the various items as well as the estimated efforts to complete the work. As part of a negotiation process between the Product Owner and the Scrum Team, a subset of the product backlog is selected which is then called the Sprint Backlog. Much happens during the building phase where the development team members select and execute tasks from the Sprint Backlog until all work is completed and a “product” is ready to present to the Product Owner. At the end of each sprint, the Scrum Team presents the various items that have been developed during the sprint to the Product Owner. This practice has a few clear benefits in that unless metrics can be demonstrated in the application – not on paper or in theory – and shown to provide the expected information, they are not completed. The final step of the iteration is the retrospection which has a few objectives where the most important one is to allow the team to reflect on the successes and determines which areas need to be improved prior to entering the next sprint. As such, the team collectively assesses its own performance and determine the best way to adapt in order to successfully achieve its next sprint.